55 year young barefoot DJ, riding an old Harley. Believes in the power of thought and the power of now. In orbit. No, this is not a hippie with midlife crisis. It is more of a midlife reflection from RTL’s Holger Richter. 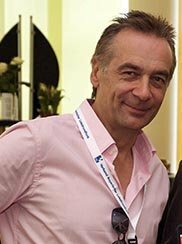 Holger Richter has been breathing radio – Berlin’s 100, 6 in and 98, 2 out – until the German airwaves got a bit stuffed and he needed new breathing techniques and new oxygen. That’s why the now director of RTL RADIO came to Luxembourg in 1995. Radio Television Luxembourg is a leading privately owned media company in Europe, and the headquarters a white giant on the outskirts of Kirchberg. A wimpy golden lion guards the entrance while a spaced out plastic cow is lazing around on the grass. Past the zoo, you enter a miniature museum from the early days of radio and film. For RTL, early days was back in 1933, with the start of the legendary Radio Luxembourg, flowing for decades on medium wave from the Villa Louvigny in the city park into millions of ears stuck to His Masters Voices and Sonoras under duvets in teen rooms. Through Radio Luxembourg, many a youngster learned English, and everybody learned rock’n roll. It is a long way from Villa Louvigny to the white giant giving RTL to Europe, but Radio Luxembourg is in the air above it and the ground beneath it. It is in Holger Richter too, and the music from Radio Luxembourg, Sweet, Deep Purple, T.Rex… turned into a dream of radio in the early 1970’s. Little did he know that radio would actually become his life, and that he would take care of the heritage when Radio Luxembourg disappeared with Nena’s Luftballons around the time Frankie stopped going to Hollywood. The circle is closed, but it’s not a Radio Luxembourg nostalgic sitting in the director’s chair. That was then, this is now, but the pop music core remains. 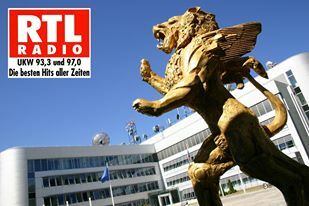 The modern success story is the concept Holger Richter introduced in 2005 after playing 10 years just oldies but goldies – RTL RADIO Die Besten Hits Aller Zeiten. 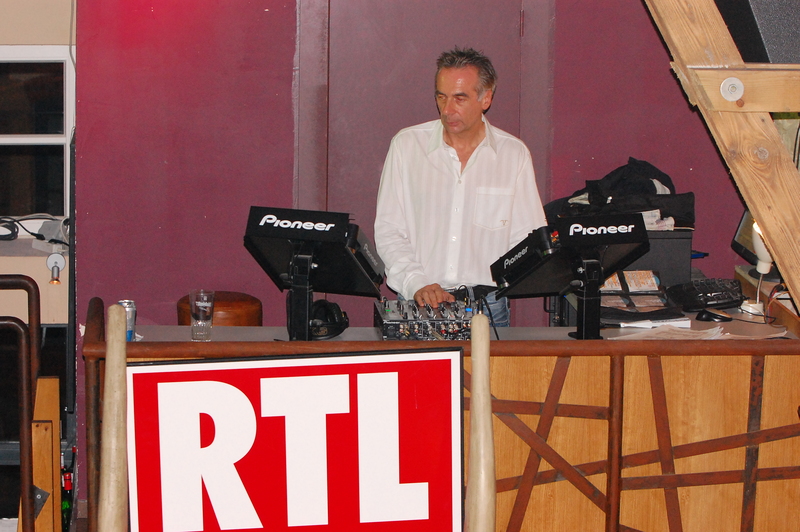 In late 2008 he started a second regional program known as “RTL RADIO 93,3 & 97,0 – Die Besten Hits im Besten Mix”. With this regional programme, playing mostly the hits of today, the station reaches listeners in Luxembourg and parts of Germany, Belgium and France, while “Die besten Hits aller Zeiten” is broadcasted via cable and satellite all over Germany, Austria, Switzerland and Denmark. Could digital satellite broadcasts reaching all of Europe be a success story for the future, and maybe even a comeback for Radio Luxembourg? He has a pleasant radio voice. Holger leaves the director’s chair empty and puts his long jeans legs in a guest chair, laidback and with all the time in the world. The freshly ironed white shirt collar has a bit of a rough, fringed edge. His office is messy enough to make it homey. In the background, U2 still can’t find what they’re looking for, and on the wall there’s a picture of Jon Bon Jovi on stage in Bettembourg back in 1996. He drives a Harley Shovel sometimes though, but he’s a bit too lazy, even though he does relax on dusty roads. He gets a bottle opener – the giant cork kind – but he doesn’t open a bottle. He fiddles – and talks. Brokstedt, north of Hamburg, 1971. 13 year old Holger is bored to death in his little home town where nothing happens. Enter the boy next door. He has a discotheque on wheels, and business is so good that he needs an assistant. Off they go, two kids and a bunch of vinyl, rockin’ and rollin’ from village to village in the German countryside. In the front seat, his friend’s mum and dad charge “entrance” fees and handle the money. Clausen, these days. Half empty bars in a row on a Thursday night. Except for King Wilma –chez the Flintstones in a modern bar version – where there’s a crowd. This is where Mr. Richter becomes DJ Dr. Fred every Thursday around six, hitting the mixing table. A wooden dinosaur skeleton, possibly T-Rex, rocks with the crowd as the music hits the beams. The sometimes barefoot DJ Dr. Fred is just as laidback as Mr. Richter, using a safe musical recipe – Die Besten Hits im Besten Mix. While he was mixing music, the radio dream grew bigger. As a young student of economics in Würzburg, he opened a student bar and got connections that brought him to a radio studio in Munich, where he got infected with the radio virus by the DJ host Goofy, whose afternoon show he visited that day. But for a leather-and-long-hair kind of guy, getting the tip of his boot inside the doors of conservative radio stations wasn’t easy. One year later, he started breathing radio as Starship sang Nothing’s Gonna Stop Us Now – the very first song played on Würzburg’s first private radio station Radio Gong, with Holger on board. The date was April 7, 1987, and from then on it was nonstop radio. OK, he got lost in space in a failed attempt at starting a rock channel. And OK, he always overslept and read traffic reports from phone booths. But the rocket steadied its course when Holger helped launch the first Top 40 Hit Radio in Germany. He was in orbit. Saturday disco, hard rock shows, morning anchor, music director, programme research and new channels in Hamburg and Berlin. Radio ga ga here, Radio goo goo there, until he landed in Luxembourg, on the field right outside the RTL giant, on the 4th of July 1995. It took him two years to wind down. Today he knows that the enforced low gear gave him a better quality of life, but in the turbo times it was all about Radio bla bla here, Radio bloo bloo there. “You know, the image of a German – quite strict, meticulous, and when he wants something he wants it now! That’s the attitude I had when I came to Luxembourg, and it got me nowhere” Holger laughs. But face it she’s Madonna… Holger has certainly tried to make the grass grow quicker. It’s not that many years ago that a leather-and-long-hair kind of guy sporting a belly became a straight and stylish health freak, with Madonna as an example – not without self-irony. He’s into the power of thought and the laws of attraction, and something seemingly banal yet both important and difficult; the here and now. This is all part of his new breathing technique, as is alternative philosophy. Holger reads books by amongst others Eckhart Tolle. The bottle opener is spinning. Holger is in orbit. He talks about new ways of thinking in the workplace, dealing with the causes and the whole picture, not just the symptoms. He doesn’t think that classic problem solving methods work anymore. To him, the frequent bursts of laughter from the corridor mirror this way of thinking. Holger the here-and-now-man doesn’t think about the future of radio, and he doesn’t worry about it. Radio is a feeling – Lebensgefühl – and radio is still alive. But the passion has changed. In this picture, creativity and the pop-rock Lebensgefühl are sacrificed on the altar of automatisation. The man who was an early surfer on the digital radio wave doesn’t know if he’d start with radio today. A few years ago, DJ Goofy resurfaced to interview Holger, not knowing the part he once played. Now he knows. The circle of life. Thinking back on his radio days and on good old radio Luxembourg, Holger fondly remembers his first “real” girlfriend, Merja from Finland. When they broke up Radio Luxembourg played “If you Think you Know How to Love me” with Smokie, still a favourite on “Die besten Hits aller Zeiten”. Radio is about memories, and creating memories. From his city apartment, he can see the Villa Louvigny, from where Radio Luxembourg reached him in his room in Brokstedt. The circle of life.